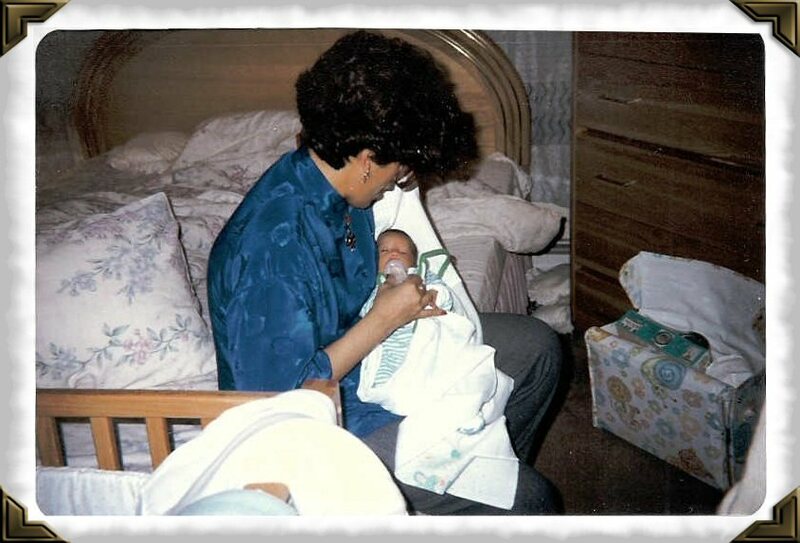 When you were born twenty seven years ago, November 5, 1985, I discovered a Mothers love. When you were born, I learned that there could be no greater love than a mother's love for her child. You were born on a cold rainy day, on Election Day to be exact. On that rainy day, Edward Koch became mayor but I held a higher seat, that of a mother. On November 4, I was at the office when I went to the hospital and discovered that I was to have a baby boy. Your father also Henry was at the bank and ran to the hospital. Of course, he was anxious since you were supposed to be born on December 10th. You were born at 10:15 AM on Election Day. When you were born you came five weeks early. On that special day, November 5th I discovered the beautiful role of motherhood. When you were born I learned what it was to become a mother. I discovered that as a mother I became number one for my son and he likewise was the most important person in my life. As Henry grew I learned so much from him. As a mother, I tried to instill values and love to my son. Parents are not perfect but our children are to us. I became a child again. I learned about prehistoric dinosaurs, I learned about science, I learned how to laugh with a child. We lived in Disney World. I experienced his happiness as a boy scout, altar boy, hockey skater and so much more. I had a wonderful life with you, Henry. On your birthdays, we had Julie the Clown; Uncle Bob dressed as Mickey Mouse and so much. When you were born you were loved. Throughout your life I experienced your love as a mother. I felt that love right back from you. Though you were taken from me in 2003, I would never trade those years that I had with you. Every birthday, I bring a beautiful wreath of falls flowers and you shine your light from the heaven as you always do. I sang Happy Birthday to you today and I didnt cry, I smiled and laughed for all the great memories of love that you gave me. I told you about the 2012 Annual Worldwide Candle Lighting Services that I will attend on December 9th. At 7:00 PM, all families that have a lost a child will light a candle. In every country at 7:00 PM people will light that candle. Those candles will represent all the children that passed on. Most of all, it represents love from parents, brothers, sisters, aunts, uncles, everyone. I will hold a picture of me and you together and your name will be read aloud. We will pray, we will meet other people who have had that lost of a child. We will remember all the happiness but most of all remember when you were born. Henry, Happy Birthday in heaven. Thank you for giving me love when I needed it. Thank you for the years that I had with you. Happy Birthday my sweet boy. I love you! Happy Birthday Henry on your wonderful life in Heaven. It is nine years since you left me and my heart still breaks for you. I wonder what you are doing now, are you looking down on me? I know you must watch over me because I have not gone mad. I have not lost my faith in God. I know you must be holding my hand and helping me to be strong. I know my love for you is so strong that it reaches the heavens. I sometimes wonder what it would have been to be a grandmother to your children but it is what it is and just having you as short as it was I am grateful to God for that time. Just recently, I visited your favorite childhood vacation spot in Disney World. I went to your favorite park Epcot and visited your wall, Leave a Legacy. In 2003 I imprinted, to Henry Anthony, Always in my Heart. Those words are so true because every day I think of you not sadly but happily of my love for you. You are who makes me who I am. Happy Birthday to my beautiful son. I love you dearly and pray when I can be with you again. Celebrate in the gates of heaven and shine upon me when I visit you. Ill be smiling and looking right up to you when you shine your light upon me. Several months ago in 2010, I received a call from my attorney telling me that he had items that were found with Henry's remains and that he could release them. I waited at least two months before I had the nerve to receive them. I asked the attorney to send them to my office not knowing or asking what the items were. When we first found Henry, they had given me a ring, a chain that I had brought him and some other items. I did not know that the police had kept these other items. I buried him with his chain, his cd that he loved to play and other momentos. When I first received the envelope, I was afraid of what I would find but when I opened it my heart was heavy with sadness but happiness also. The first item was his school ID that was taken in the fall of 2002 several months before he drowned. Oh God, he was so handsome. What a beautiful picture. The second item was his earphones that when the weather changes I will bury them in the earth where his body remains. The third item was a silver ring that I brought him. He loved to wear that ring. Tomorrow will be eight years since I lost my only child and what remains are the memories, the pictures, videos and the most important thing that I have of him which is his love and some of his writings. I have had in my possession a book that I have not shown anyone. It contains some of his thoughts that at whatever moment he decided to write them down. Like everything else, I have read them and put them aside to reread again. Henry was 17 years when he died. At 17, we all want to know who we are. We want to know what our purpose is. I am so positive that he would have answered those questions. Henry liked to doodle. In one of his writing she said "Don't be afraid, just let your light shine" or "You are O.K." with a smiley face. When I was in church today, I asked God to give me strength on the anniversary of his death. I asked God to please give me peace, to make me strong, and not to think about his death but his birth into Jesus 'hands. I have learned much since Henry's death. I have learned that there are so many people that love and support me. Even though they may not understand what a child's death does to a parent, they do know how much I loved my son and what his death did to my heart. After all these years, I still have all the newspaper clippings of his accident, the news articles of our work with E911, the audio of his last words spoken on this earth, the call to 911 for help. The last time I heard those words were two years ago when I just wanted to hear his voice but I will never hear them again. I cannot deal with the pain of his cry for help. That will remain tucked away to never be heard again. You may ask why do I keep these things but to get rid of them would erase the existence and the meaning of his life. This is what happened and I cannot forget or erase it from my mind. It is what it is and that is part of my life. I talk to the other mothers who have become my dear friends and they feel the same way that I do. They go on with their lives, existing, loving their other children if they were fortunate enough to have them. They go on with their lives because they have to. Because our children would have wanted us to . I truly believe that Henry is with God and that lessens the sadness that I have in my heart. I know that one day I will be reunited with him. That one day I can hold him one more time. Some people do not realize that when you lose your child there is never closure. I dislike that word but I use it for people that have never lost their child. That loss does not disappear. It is not erased. It lives with you forever but you go on because that is all you can do. Tomorrow, in the morning I will go to Mass before I go to work and I will be strong. I will use the love that I have as my strength. I will use the memories of Henry as my shield and if I choose to cry, it will be tears of love, tears that I had a time to love him and that I will be with him one day. Henry, you were the best thing that ever happened to me! I love you forever. Mourning is everlasting when you lose your child. I say everlasting because the mourning never ends. You just mourn differently, silently but your heart is still broken and you still feel the loss, especially in the night. This is the way it has been for me for the last seven years. I lost my beloved son, Henry Anthony "Poco" on January 24, 2003. At times, it seems like yesterday and, other times I cannot define the time. The loss is even greater on his birthday. I try to say to myself that I will see him again, that he is in a better place but then I say "why, he is gone". I know that Henry had so much potential to make a difference on this earth yet I know hes at peace in Heaven. Now some people who may not have ever lost a child will say you need to go on. The fact is that I have moved on with my life but the void is still there. It will never go away. I am convinced of that. So, though it may make others feel better to think that "IM OKAY", Im really not. I go on with the love that I had for my son and share it with others. I no longer think of the way he tragically died of drowning but rather his new life with God. But this doesn't change how much I miss and wonder how life would have been with him. Since his death I use to frequent the cemetery at least once or twice a week but now I go only on holidays, his birthday, the day of his death, Christmas (I decorate the grounds), Valentine, Palm Sunday, Easter and summer where I plant flowers on his grave. I no longer look down to his grave but look up to the skies where the sun always shines upon me. I believe he watches me and gives me signs that hes happy. Though the thought makes me happy, it still saddens me. I still miss him tremendously and, at times, I wish I were with him already. I have so many memories of Henry in many forms: websites, videos, pictures and a memorial garden. What I miss the most of all is sharing my love from my heart to him, his smile, and the way he would hug me. Yet, I can never change my feelings of loss; I can never forget Henry. He was the best gift that I ever received in my life. He was my accomplishment. He made me the mother that I was. His love made me the person who I am today. What most people do not realize is that a Mother never forgets the pain of loss, the absence of their child, and the loss of their future. Everlasting is what it is and will always be. So Henry on this birthday, I embrace you, I cry for you, and I will love you throughout eternity. When I read emails or comments from your friends, I realized how much you were loved. Not just from your family but from your friends. I also realized how much of an impact you left upon them. However, I am not surprised when they speak of your kindness, your sense of humor, and your intelligence. Thank you Henry. Thank you for the way you made me feel and for every day we had the chance to be together. You have always been the greatest blessing in my life. And never ever forget that I am and always have been proud of you. I know you would have made a significant impact in life. Would you have been a father, writer or a teacher? Perhaps, you would have been all three. As a father, you would have loved your children, as I had loved you. As a writer, you would have written about truth and justice because you had such a sense of conviction. I remembered one day, a couple of months before you died, that you wanted to go a demonstration. It was a demonstration against the war. At first, I was concerned that something bad would happen and you would get in trouble, but then you explained to me why this was important to you. You thought that war was wrong. You understood why people thought they had to go and fight, but you felt it wasn't our war and that we should not die for it. That perhaps there was another way of solving those problems. A teacher may have been your way because what I read from your friends or people that knew you is that they learned things from you. They learned kindness, humor, knowledge, and love. There is a sense of love that I derive from emails that I still receive seven years since your death. Am I surprised? No, I am not because if you were still here, I know the kind of man you would have become. You would be someone that I would have been proud to call "My Son". Happy Birthday on this special day in Heaven. You would have been 24 years on this earth but I believe in Heaven that you are still my 17 year old angel. I hope you love the flowers that I laid on your grave. I do not look down on your grave but to the heavens where you always shine your light upon me. I will not talk about your departure from me but only about our love together. I have so many memories of you surrounding me in our home, my office and of course, in my heart. When I look at your pictures, like the one of you on your bunk bed looking like youre ready to fly like Peter Pan, I feel such an abundance of love and I feel your arms around me. That feeling makes me so happy but, at times, so sad because youre not here. The word closure is such a funny word to me. It must have been created by someone who never had children but lost someone. The fact is that the loss is with you always. It doesnt disappear. After time it is just different. You learn how to be happy again but inside of you, deep down in the corner of your heart, there is a piece missing and you learn how to live without that piece. Henry, I thank God everyday for having you in my life. I thank God that I was your mother and you were my son. You are my soul; you are my inspiration that makes me who I am. I love and miss you so much, but that void will be filled when I see you again one day. You are part of me as I am part of you. Henry. my only gift that I can give you today is my everlasting love and that I live my life with love, faith, and hope for this world. Happy Birthday, my darling son, Henry. You are forever in my heart. I prayed and asked God to bless our sons as I threw the yellow roses who died together on January 24th, 2003. I only remember and respect that day. Happy Birthday on your special 23rd birthday in Heaven. I want to give everyone a gift of hope, faith, and love on your special day. Though sadness is always real, especially on this day, I want to convey the hope that I receive when I visit your grave. This past week, I visited your grave and brought you a special birthday wreath shaped in a heart with fall colors; something that I knew you would approve of. As I lay the wreath and sang "Happy Birthday to You", the sun shone upon me. Though I was saddened, I was elated and full of happiness knowing that you were communicating and giving me a sign that you were there. I have often told Titi Margi that, regardless of the weather, each time that I am there, the sun shines upon me. Of course, I know that people were accepting what I was saying as my truth but they were not believers as I was. It was only when they were with me that they experienced the same. Of course, I cried on your birthday but I cry now for the love that you gave me and the faith that I will see you again in my other life. You have shown me how to live, how to love others, and to practice my faith, not just in God, but in humanity. You were my gift not just on this earth but in heaven. Through the life I shared with you on this earth was short, I received so much more than even others who have had a lifetime with their child. I no longer say why? I say thank you, Jesus, because you were my special gift of hope, faith and love. I can watch videos and smile, laugh, and cry with happiness. You had a full life even with your short stay here on earth and that is so special to have. Many people miss you but we have learned to grieve with happiness of who you were and not with anger, or despair of your departure from us. I will not say that I'm not sad on this day, or the day you left us, but I will say that I know you are in such a special place with the grace of God. Henry, Happy Birthday, and God Bless you for every love and hope that you have given me. Happy Birthday, my darling son, and thank you for the love that I still feel within my heart. Happy Birthday, Poco, for God has not forsaken me with the memories that I have of you still so fresh in my mind. Happy Birthday, my sweetheart, I will love you forever in my heart. It is now my 55th birthday, 5 years later (three fives) is there a meaning? Do people remember the pain that I suffered? Why couldn't I have one more day with you? Today is your birthday. I had a dream about you a few days ago. Remember when you were young and I was sleeping? You would sneak in and ask to sleep with me because you were afraid of sleeping alone in the dark. In my dream you were wearing your white pajamas with characters. I moved over and you climbed in. It felt so real and when I went to touch your leg like I used to, I woke up and realized that I was touching Gingers leg, our dog. In the past, if I had dreamt something similar I would get depressed because I knew you were gone. This time, I felt like this was a message to me from you. I felt that you were telling me that you were happy and that you were being taken care of. That you felt protected. I felt a sense of calmness that I hadnt experienced before. Happy Birthday, my darling son! You would have been 22 years old. Its hard to believe that almost five years have passed. This past Friday, which was All Souls Day, I went to Mass at Fr. Toms Church with Grandma, your Dad, your sister Mia, and Hector. Everyone who had lost a loved one displayed their pictures on the altar. I put yours and your grandpas picture. I did the reading from the Book of Wisdom and Mia and I brought up the gifts. Everyone came up and said their lost love one's names. I said Henry Anthony Badillo, my son, Antonio Ruiz, my dad, and Peter Ruiz, my brother. It was a beautiful Mass and I left there content, knowing that you are together with my father and brother. Henry, I want to celebrate your life, your life with me and your family. I will always grieve for you although differently as time passes. I will not let dates control my life as I know that is what you would not want. For the last four years that is what I have been doing. Your birthday, holidays, your drowning, 9:58: the time you called 911 for help, the recovery of your body, and your burial. I know that you would not want me to live this way. Your death broke my heart and my spirit but this is not what you were about. The birth of you brought such happiness to me as your Mother. I miss being your mother but your being my son will always be a part of me. I will always be your mother as you will always be my son. When people ask me if I have children I say, Yes, but my son is no longer here with me". I AM STILL YOUR MOTHER AND YOU ARE MY SON. That will never change. Today, I will celebrate your birth. I will celebrate my love for you and share my memories with whomever will listen to me. On the date of your death, I will silently pray for you as I always do, but I will not let this rule me. I will not think of the way you died, but the way you lived and the love that you brought me. I will think of you every day and pray that God protects you as He did that night when you entered your next life. I will live my life without you, but I will have you in my heart. You are part of me as I am part of you. Happy birthday, Henry! You were my gift in life and you will be my gift when I join my next life. I love you. To act as if its alright! But what can one say? Why does my life feel like purgatory? Will you tell God not to wait too long for me? Is this a dream? Time is going so fast. Happy 4th Anniversary in Heaven. Tell the angels to protect me and your family. Grandma misses you so much. I close my eyes and imagine his touch, his embrace. Happy 21st Birthday in Heaven! I wanted to write something special for you on your 21st birthday but it has been difficult. Almost four years has passed since your death and perhaps some people feel that it should be easier for me to deal with my loss but unless a person has been in my shoes they will never fully understand what I or others who have lost their children feel. I have learned that there is a bond amongst the so many of us who have lost their children. When I was 5 years old your uncle Peter, who was 8 at the time, died of a heart attack at home. Peter had been sick for a couple of years and had been in the hospital back and forth. He had been home for a only a couple of days when he suffered a heart attack and died. Years later, as a teenager, while visiting his grave, your grandmother was hysterically crying. I asked your aunt, Titi Margi,“Why is she crying like that? He’s been gone so long!” How ignorant I was! I would not come to understand her feelings until I became your mother. Because when I became your mother I knew that I would rather die than that you should lose your life. You were born on November 5, 1985 at 10:15 am at Beth Israel Hospital. It was Election Day. The previous day I was at the office because you weren’t expected to arrive in this world until December 10th. My doctor was in my office building and I wasn’t feeling too well so I decided to visit her. Well, to make a long story short, I went back to the office and told them that I was going to the hospital to take a sonogram and I would be back. Little did I know that you were to be born prematurely the following day. We named you Henry Anthony. We nicknamed you "Poco" because you were so small. You stayed in the hospital for three weeks but your Dad and I visited you every day and until you came home the day before Thanksgiving. From the day you were born, you became the center of my life. From the age of 2, we made “Disney World” our vacation resort. We traveled every summer to Disney World. In the spring, we would visit either Puerto Rico to visit your grandparents or go to Washington, DC to visit the museums. You loved museums. At 2 years old you knew all the names of dinosaurs. You enjoyed reading, learning and so much more. You and I enjoyed visiting the Planetarium in NY. You loved the Bronx Zoo. We did so much. I always enjoyed helping you with your science projects, and participating in your boy scouts. I learned so much from you. The most important benefit was that I learned about ‘LOVE”. Loving a husband and parents is so different from loving your child. The love that I received from you as your mother enabled me to love others. It made me the person that I am today. I don't know whether you remember Ann Finnegan from our office in Albany, but she made me the godmother of her son. His name is Benjamin Anthony Miller. She gave your middle name to her son. What an honor I felt. I love that little boy. We always speak on the phone and I see little things in him that remind me of you when you were a little boy. You gave me a gift of love that I cannot give away fast enough. As you became a teenager, it was sometimes a trying time for us but it was because you were trying to find yourself as we all do. You never stopped loving your family. You enjoyed the holidays with your family. You loved sitting around the dining table and we would talk about when I or your Titi Margi or Uncle Joey would get into trouble as children. We would laugh about it because that was part of growing up and finding one's place in life. Henry, I believed that when you left me and went into Jesus' arms you were in a good place. There is no doubt in my mind that your life as an adult would have been a special one. There is no doubt that you would have made a difference in this world of ours. Your sensitivity and kindness towards others were always a mirror of what you received from your familiy's love. On January 24th, 2003 at 8:01 pm I spoke to you for the last time. We spoke for awhile and then as always, we ended our conversation with my saying “I love you”. You would always say “I love you too, Mom. How I miss hearing those words from you! What I will also miss is not seeing you as an adult.. I will never see you as a father. I will never become a grandmother but I will always be your mother. I will always love you. As time passes, I will get better at dealing with your not being here with me but I will never forget our love. The love of a mother and her son is so special. What better gift can one give to another? I think of you always and always in a good way. I try not to think of how you died or how I was not able to touch you when we found you four months later. What I will remember always is that I was blessed to have you as my son. I thank God that He brought you home to me. Henry, I will always love you and you will always live in my heart forever. Happy Birthday in Heaven! We will always be connected in life and death. Will the pain ever leave me? Will the loss ever be understood? Will I ever be with him again? Will I be able to touch him again? How can I not remember you? Youre in a place of peace and rest. Maybe, Ill still find you near. Missing you every day, hour, minute, and every second of my life. Missing you on this day called Mother’s Day. What is a Mother? A Mother is one who gives life. She is like no other. A Mother will love you till the day she dies. No Mother should lose her child before her time. Henry, you are always in my heart. My faith in God assures me that I will see you again one day. And I still have much to learn. And you will light my way. I will then become Your child. "This is the closest to Heaven that I can be close to you. Until we meet again." I THOUGHT I SAW YOU TODAY! AND I SAID "YOUR SON LOOKS LIKE MY SON"
I know that God was there! My heart is full of love for you. It is in my heart that I hold your love. I cannot believe that it has been two years since you were taken away from me. I pray to God that you are patiently waiting until I can meet you again and show my love for you. When you were found I wasn't allowed to say goodbye the way I wanted to. I wanted to hold you and kiss you and tell you that you will forever be in my heart. People say that you are in a better place. They do not know what else to say, but I do know that you are in a better place. I believe that we are all being tested here. We all make mistakes. Some are costly and some are deadly but you are in a better place. I never thought that I would be here today writing this or thinking of you in another place. Never did I think that I would not see you grow up to be a man. But here we are, you in heaven and me on this earth. Thinking and feeling you in my heart. A mother's love is such a beautiful thing. The day that you were born I became a mother, I became someone who loved a little thing like you more than life itself. Everyone expresses their grief differently but I'm not grieving your death, I am celebrating your life. Titi Margie and I made this web site to celebrate your life. We dedicated a garden in the back yard to you. It was made with love from me and Grandma. We gave three scholarships this past June at Holy Family and one at Humanities Prep. Everything that I do is for you to thank you for the opportunity of being your mother. I love you and may God bless you. You have given me a lifetime of memories, a lifetime of love. Grandma, Titi Margie, Uncle Joey, Uncle Donnie, Uncle Lee miss you so much. Ginger is taking care of me. Everyone watches out for me. I am a godmother to Ann's baby. His name is Benjamin Anthony. They named his middle name after your middle name. Please watch over him and bless him. Please watch over Grandma and Mia. Henry, I love your little sister. She does little things that remind me of you. My heart is saddened because you are not here with me but I know that we will be together again one day. I love and miss you! bringing light from shadows and help to soothe me so. My son, like the candles, gave my life true light. I use the candles' beacons to connect us in the night. is that he'll see my signal and know my love's expressed. As his light joins my lights, our worlds touch and flame. As I snuff out the candles, I softly say his name "Henry".